Usually when I design a CD or book, my client and I can do everything over the phone and email. They upload their photos and text to me, we discuss the design concept they are looking for over the phone, I put together a draft and then email them a jpg or pdf to review. For most projects, this works well and smoothly, and allows everyone to focus on the design at their convenience. I’ve designed hundreds of projects this way. 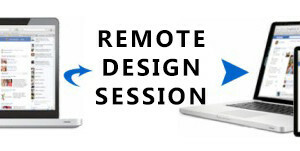 Remote design sessions probably aren’t necessary for most small projects, but it’s nice to know it’s just a mouse click away if you need it.